According to design experts, your bathroom isn’t complete without a strategically placed mirror. Whether you simply want to have some fun with your bathroom interior or mask an awkward layout a nice, well placed mirror can be just the thing this space is missing. If you’re finding it a challenge to come with the right bathroom mirror we’ve created a list of unique ideas for using this accessory in your powder room. Lacking wall for a mirror? Consider suspending a nice mirror on a cable wires over your vanity. This is an unordinary way to showcase a unique mirror and it is ideal for homeowners who embrace a minimalist, industrial or an eclectic style. 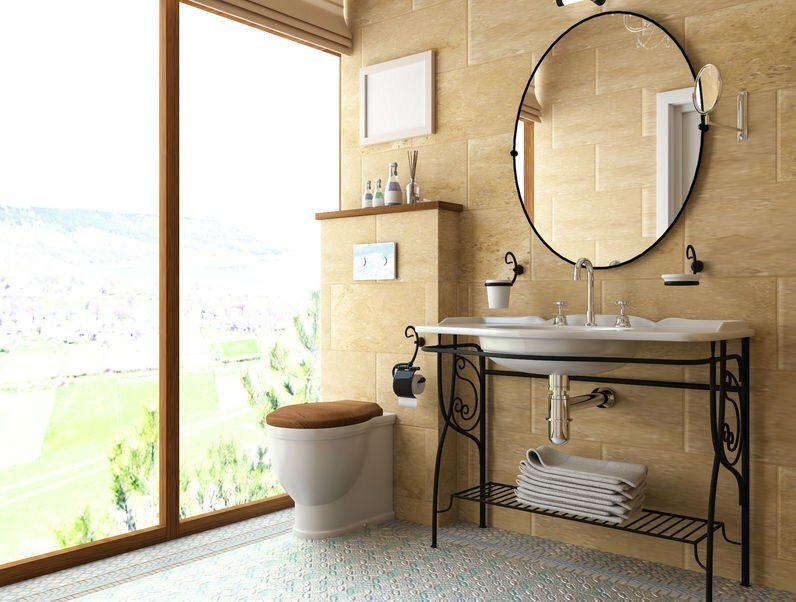 Suspending a bathroom mirror is ideal for particularly small or oddly shaped bathrooms where installing a mirror against the wall just isn’t the option. Some of the pros of this solution include is that it provides the illusion of privacy especially in large bathroom spaces and it provides more freedom with your floor plans because you don’t have to install the vanity against the wall either. If you decide to install a suspended mirror in the bathroom you should have this job completed by a professional. You’ve probably never seen a mirror installed over the front of a window. Yes, mounting a mirror on the window casing frees up lots of wall space and it’s creative. This also allows you to make room for a freestanding shower or tub if you’ve been contemplating expansion. Double the size of a small bathroom by creating a wall covering with mirrors. When creating the wraparound effect, you’ll need to use a series of mirrors that have been specially cut to provide that wall to wall look. By adding more reflective surfaces you’ll instantly brighten the room as well as add a sense of depth. This is a great solution for bathrooms that doesn’t have any or has just a single window. If you really want to make a powerful statement, consider mounting a mirror on top of another mirrored surface creating a layering effect. This is a less expensive option to a stone or glass tile backsplash and it allows for more light to be reflected into the bathroom. Hi, Thanks for the coming to me at the right time. I have been thinking to buy a wall mirror for my bathroom. After reading this article I found here some useful tips these would be helpful to me when I am going to fix my bathroom mirror. There are numerous types of mirror comes in the market which can make you bathroom looks more and more attractive. As we all know that an aesthetic mirror in bathroom is center of attraction. Choose the bathroom based on your wall size and color of the bathroom interior. My wife and I have been wanting to remodel our bathroom and we are looking for ideas about what we want to do. It is a small bathroom so a wraparound mirror might be a good idea to expand the perception of the room. I’ll have to show this to my wife and talk about having a professional install a new bathroom mirror for us.